Through much of the 1990s, New Japan and WCW had a loose working relationship that sporadically saw them exchange talent for big events or entire tours. On November 13th and 14th, New Japan had a pair of events in Tokyo with the entire cards featuring New Japan vs. WCW. The tour was called "WCW in Japan" and all the big names were in attendance. On the first event, the highlights were Osamu Nishimura vs Ric Flair and Keiji Mutoh vs Steven Regal, as well as the match I am reviewing today. The second event's main event was Keiji Mutoh and Sting vs. Ric Flair and Arn Anderson. The shows were a giant success, as Sumo Hall was full for the first show and 4,500 were in attendance in Hamamatsu Arena for the second event. The main event of the first show saw Sting defend the WCW United States Championship against Kensuke Sasaki. At the Great American Bash, Sting defeated Meng to win the vacant title. 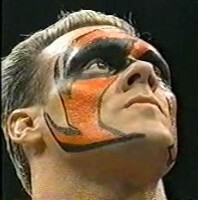 It was Sting's second reign with the championship, with the first being in 1991. Kensuke Sasaki by this time was already a four time IWGP Heavyweight Tag Team Champion and more then qualified for a title shot not only due to his success in the tag division but also because of his success in the feud with the UWF-I. The stage is set, let's get to the match. Before the match begins, the national anthem plays for the United States and for Japan. Kensuke Sasaki's new wife, Akira Hokuto, is at at ringside doing commentary for the event. They shake hands before the match starts and the referee rings the bell. Side headlock by Sasaki, Sting Irish whips out of it and the they collide with neither man going down. Sasaki goes off the ropes, Sting goes for a leapfrog but Sasaki catches him and slams Sting to the mat. Dropkick by Sasaki and Sting falls out of the ring. The referee starts the count, but Sting returns at 7. Tie-up, side headlock by Sasaki, Sting Irish whips out of it and he delivers a dropkick before clotheslining Sasaki out of the ring. Sting then gets a running start and sails out of the ring onto Sasaki, getting a loud cheer from the New Japan crowd. Sting slides Sasaki back in the ring and comes off the top turnbuckle with a diving lariat. Cover by Sting but it gets a two count. Sting grabs Sasaki's leg and applies a single leg crab hold, but Sasaki makes it to the ropes. Kicks to the leg by Sting and he applies the single leg crab hold again, but again Sasaki gets a hand onto the ropes. Sting kicks Sasaki in the leg again, he trips him up and yanks back onto Sasaki's left leg on the mat. Sasaki gets out of it and chops Sting in the corner, body slam by Sasaki but when he goes off the ropes Sting dropkicks him in the knee. Sting goes back to the leg but Sasaki crawls to the ropes to force a break. Sting picks up Sasaki and slams him to the mat, he then goes up to the top turnbuckle and goes for a diving body press, but Sasaki gets his knees up. Sasaki chops Sting in the corner, Irish whip, and he delivers the face crusher. Sasaki drags Sting to his feet, Irish whip, and Sasaki delivers a dropkick. Cover, but Sting gets a shoulder up at two. Irish whip by Sasaki and he hits a powerslam, cover, but again it gets a two count. Sasaki picks up Sting, Irish whip, reversed, and Sting hits a modified backdrop suplex. Sasaki is up first, he picks up Sting and hits a backdrop suplex of his own. Cover, but it gets a two count. Sasaki applies the Strangle Hold Gamma, but Sting makes it to the ropes. It is clear here that the crowd was not expecting a title change at all. They were mostly quiet, except for some of the bigger moments such as Sting flying over the top rope or Sasaki getting out of the Scorpion Deathlock. But when Sasaki got the three count the place became unglued, showing that they had Sasaki's back all along but didn't think he had a chance to win. Hokuto actually began crying at ringside, as Sasaki became the first Japanese wrestler to ever win the WCW United States Championship. Sasaki had fought through all of Sting's moves to take home the championship and no one doubted that he had earned it. Kensuke Sasaki would hold onto the title for about a month and a half before dropping it to One Man Gang at WCW Starrcade 1995. To many, the match between Sting and Sasaki was the last notable match of the championship for some time as the next two champions (One Man Gang and Konnan) did not have many important matches with the belt and it lost prestige over the years. In 1995 however it was still a big deal, as stars such as Vader, Steve Austin, Ricky Steamboat, and of course Sting had all held it from 1993 to 1995. 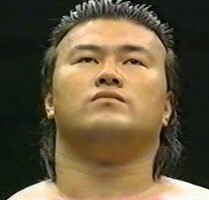 Kensuke Sasaki didn't have any successful defenses with the championship, but it was his first singles title of his career and it continued his upward path until he finally took home the IWGP Heavyweight Championship in 1997.